(sixth from left) and other Rockwell Land officials. The “Rockwell lifestyle” has finally arrived in Ortigas area. 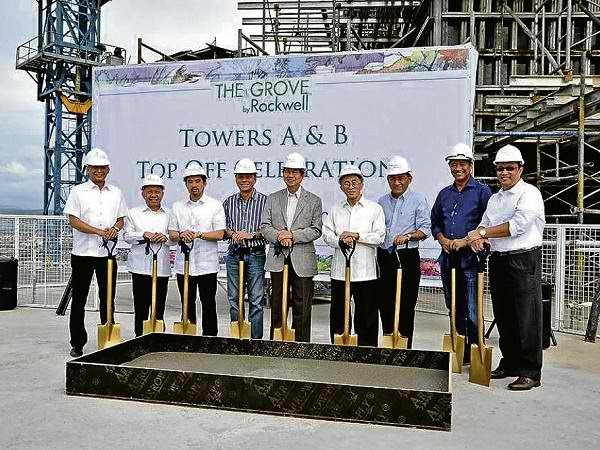 Upscale property developer Rockwell Land Corp. recently unveiled the finished structures of The Grove’s first two towers against the Ortigas horizon, as it topped off Towers A and B on Oct. 28. “We are very excited to bring The Rockwell Lifestyle to the Ortigas area. Now that all 24 floors of Towers A and B are up, it is even more thrilling as we literally see a piece of Rockwell amid the Ortigas skyline,” said Valerie Soliven, vice president for sales and marketing at Rockwell Land. “With four more towers to go, all we can do is watch with bated breath as Rockwell redefines the Ortigas skyline,” Soliven added. The topping-off ceremony, which was held last Nov. 25, was proof that construction remained in full swing and, more importantly, on track to its scheduled completion and turn over of units to owners and investors by June 2012. The topping-off ceremony was graced by none other than chair emeritus Oscar Lopez and Rockwell Land chair Manolo Lopez, both of whom bravely rode the Alimak (construction elevator) to the highest peak of the buildings. Over 300 other attendees, including members of the board and executives from the Lopez companies and Rockwell Land, as well as unit owners and clients, were treated to wine and good food, and serenaded by Vince Lahora’s saxophone, which played familiar holiday tunes. The Grove, Rockwell Land’s first residential enclave outside Makati City, is set to make its mark and further elevate the bustling Ortigas area. The six-tower property project is situated on E. Rodriguez Jr. Avenue and will open up more chances for people who want a “100-percent Rockwell” living experience. According to the company, the Rockwell Lifestyle has been continuously achieved through the creation of secure, exclusive and relaxing communities through topnotch developments designed with the attention to detail and international standards. The Grove’s strategic location, which is minutes away from the Ortigas business district, hospitals, schools, business establishments and other places of interests also makes it a premium investment. “We are not just here for the profit. In fact what was originally planned as an eight-tower development has been trimmed down to six to give residents more space to move. Those two towers could have allowed us to offer more units and a better profit margin but we didn’t want to sacrifice the comfort of our unit owners,” company officials explained. “The number of units for every floor has also been limited and regulated to ensure that there will be no cramped corner. We have set up four elevators for every tower to guarantee that waiting time would be short,” they added. What further makes it a catch is the fact that it is priced more affordably at P7,000 a month. Despite so, The Grove followed the same building standards its previous Makati projects had.